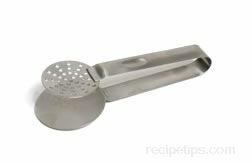 A kitchen utensil used to grasp food so it can be moved from one location to another to be flipped, rotated, adjusted, or retrieved from areas that may be hot or simply best handled with a Tong. Available as tension activated, spring loaded, or scissor type designs, there are many different tongs with sizes available for a variety of uses. Tongs are constructed of stainless steel, wood, nylon, aluminum, and other heat resistant materials with a few designs having plastic or silicon coated areas on the handles as well as the Tong tips to provide a more comfortable or secure hold when grasping and holding various food items. Tongs coated with soft, heat resistant silicon have an ability to gently grip foods such as eggs or tender vegetables for removal from boiling water and cooking pans. Most heat resistant silicon on utensils produced today can typically withstand temperatures in excess of 500ºF. Varying in general sizes that range from 6 to 20 inches in length, Tongs are available for numerous types of food preparation activities. 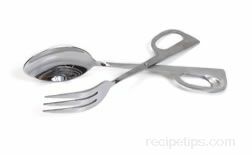 Smaller sized Tongs, often referred to as "serving Tongs," are used for handling small ingredients during the preparation of foods or during the serving. Most often made with either a forked or flattened ends, the smaller Tongs work well to handle small servings of foods in buffets or on appetizer plates and trays such as cheeses, meats, vegetables, and fruits. Tongs that are larger in size are generally used for placing or removing foods when grilling, stove top cooking or oven baking where the longer length keeps hands away from heat and the size allows easier grasping of items. Since larger Tongs can spread up to 10 inches when open, many will have locking mechanisms that enable the Tongs to be locked together for storage or for holding some items more securely. When selecting Tongs, two key points to consider are the type of use and the type of gripping ends desired. If the Tongs are to be used for delicate food items, a flat, slightly scalloped or padded end may be best. Some of the scalloped ends vary in depth, so delicate or semi-delicate foods are best served with a more gentle scallop rather than one that is deep. The deeper scallop is best for serving irregularly shaped objects, such as potatoes or other similar items. Flat, uncushioned ends do not work well for all types of foods, especially heavy or large objects, which may have a tendency to slide away from a flat surface. If much of the food being prepared using Tongs is small in size, it is definitely better to have tongs with small or delicate ends where precise or gentle retrival or placement is more important. Some Tongs that have spiked or forked ends assist with gripping chores. Also, consider the comfort desired when using tongs. Larger hands find it easier to hold bulky Tongs, but smaller hands typically do not, so make sure the size of the utensil feels comfortable for the use.